Pumping height : useful up to 60 metres plus. 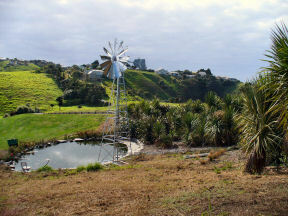 Horizon Windmills are a life long investment and may increase property values. Let us know what your situation and requirement is and we will tailor make your windmill to suit. Your windmill will take approx. 6 weeks to build subject to galvanising turnaround and we require 2/3 deposit on ordering. We will deliver and install your windmill nationwide and ensure the pump is running properly. 2/3 deposit on ordering and final third paid on installation day. $7585 for a 12 blade American model through to $8750+ for a large decorative, colourful model. Prices subject to change due to steel prices. Prices include installation & GST. 5 Year guarantee (excludes piston and seals in the waterpump). Price's are for windmills assembled and installed 100klm radius of Auckland Central, travel extra's will apply further out.